Greg Hardy of the Dallas Cowboys looks on from the sidelines before the Cowboys take on the Philadelphia Eagles at AT&T Stadium Nov. 8, 2015, in Arlington, Texas. Last week, Deadspin released images of the bruises Nicole Holder received when assaulted by then-boyfriend Greg Hardy, a star defensive end for the Dallas Cowboys, who, at the time of the assault, played for the Carolina Panthers. The images were included in an extensive and harrowing piece from Diana Moskovitz on the assault. And even as your mind pictures Hardy—who, at 6 feet 4 inches and 280 pounds, is exceptionally large and powerful even by NFL standards—assaulting a woman, the actual details of the assault somehow manage to be worse. Predictably, the images were met with near-unanimous outrage. Some called for the Cowboys to immediately suspend or release Hardy, or for the NFL to extend the suspension he already received (four games). Others took it further, demanding that the people who hired Hardy (namely, Cowboys owner Jerry Jones) and the people who shortened his suspension (namely, NFL Commissioner Roger Goodell) should receive some sort of sanction. Some even got outraged at the outrage, because this incident is well-documented. (As is Hardy’s reputation as a generally terrible person.) The fact that it takes an actual image of this type of domestic violence for some people to become outraged at it is an outrage in itself. Many also saw the obvious parallel between this incident and Ray Rice’s assault of his now-wife, with the only substantial difference being that Hardy is still an outstanding NFL player. Therefore, he is still a valuable commodity, and Rice is not anymore. Which is why Hardy is still employed, and Rice is not. And we all—myself included—paused the outrage to enjoy another full fall Sunday of NFL football. Here in Pittsburgh, as we were blessed with another unseasonably warm and sunny weekend day, we—myself included—spent several prime daylight hours sitting on our couches watching men play outdoors in the amazing weather we were hellbent on ignoring. Although there may not seem to be an obvious connection between the Hardy-related outrage and our (collective) infatuation with NFL football, these two things are inextricably linked. They’re not just family; they’re fraternal twins. Consider the first two results that populated when I Googled “nfl ratings money” just now. The average NFL team value is $2 billion, up 38 percent from 2014. NBC’s NFL Kickoff, which saw the New England Patriots beat the Pittsburgh Steelers 28-21, brought in 27.4 million viewers, making it the second-most-watched NFL Kickoff game in the event’s 14-year history. Despite the NFL’s ongoing controversy concerning concussion and chronic traumatic encephalopathy, and its high-profile instances of players committing domestic violence, and its consistently terrible manner of handling those instances, and its transparently hypocritical support of breast-cancer research, and its allowing one prominent franchise to be named after a racial epithet, and dozens more things I could list but won’t because I want to keep this under 20,000 words, the NFL is as popular and lucrative as ever. And this, the NFL’s growing popularity and unfathomable financial success, renders our outrage meaningless. Actually, let me rephrase that. “Meaningless” might have been too harsh. The outrage and the criticism and the pushback have some value. But it’s incomplete without consequence. Basically, if we want our outrage to actually matter and not just be us typing and speaking into the void; if we want people like Greg Hardy to be unemployable in real life and not just on the Internet; if we want the things we want to change to actually change, what we have to do is obvious: stop watching the games. Our power is in our patronage. Because our patronage is what keeps the NFL swimming in money. Without it, the NFL—like any business—would be forced to acknowledge what its former patrons are so upset about. Would be forced to make more than superficial and cosmetic considerations of the outrage. But with our continued patronage, there’s no incentive, no reason, to do anything other than what they’ve been doing. Ultimately, we’re expecting a business, an inherently immoral entity, to change out of some sense of morality. Or, laughably, a sense of shame. But unlike what happens when a celebrity is caught saying or doing something offensive, a few angry tweets and livid think pieces in response will not produce the NFL’s equivalent of the apology tour. Because there is no equivalent. There’s just money. And as long as we continue to hand it to them, the Dallas Cowboys or the Arizona Cardinals or the Pittsburgh Steelers or the New England Patriots will continue to hand it to Greg Hardy. And then, when Greg Hardy is no longer a high-functioning NFL player, it’ll be handed to the next Greg Hardy. 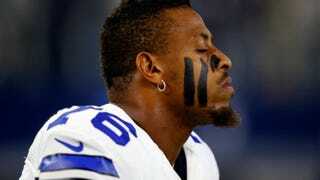 Because as long as there’s no real reason for there not to be a next Greg Hardy, there will always be a next Greg Hardy. And if you think I’m insane, that affecting a business’s bottom line by removing your patronage and/or participation isn’t the best way to force it to make tangible changes, perhaps you should ask Tim Wolfe.